them, it also helped nurture their reading skills. The first of them was Bozo at the Circus, issued in 1946 by Capitol Records. It was highly innovative, very popular and much imitated, and it made a good deal of money for the character's creator, writer/producer Alan W. Livingston. Bozo will be remembered a very long time, and not just as a slang expression for someone with no brains. (That use preceded the clown, but was undoubtedly made more popular by him.) When we think of fictional characters named Bozo, we don't think of Bozo the Bear or Bozo the Robot, both of which enjoyed modest success in their times. 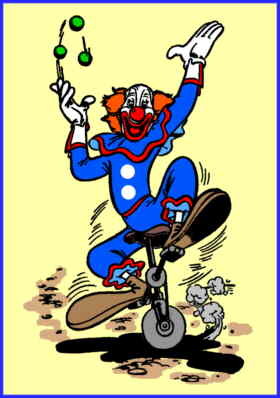 The only one we think of today is Bozo the Clown. Text ©2002-06 Donald D. Markstein. Art © Larry Harmon Pictures Corp.